Ryan Stanek – RHP – Arkansas – Jr. 4IP 2H 1ER 1BB 4K. (W, 1-0). Likely top 10 pick in 2013. Jonathon Crawford – RHP – Florida – Jr. 3.2IP 3H 2ER 1BB 4K. Daniel Gibson – LHP – Florida – Jr. 1.1IP 0H 0ER 1BB 1K. Keenan Kish – RHP – Florida – Jr. 1.1IP 2H 0ER 0BB 1K. Bobby Wahl – RHP – Mississippi – Jr. 6.1IP 3H 0ER 3BB 8K. (W, 1-0). Impressive win against TCU. Aaron Nola – RHP – LSU – So. 6.2IP 2H 0ER 1BB 9K. (W, 1-0). 2014 Draft Prospect. Kevin Ziomek – LHP – Vanderbilt – Jr. 6IP 4H 1ER 1BB 7K. (W, 1-0). A.J. Reed – LHP – Kentucky – So. 5IP 6H 2ER 0BB 4K. (W, 1-0). Jacob Lindgren – LHP – Mississippi State – So. 6IP 5H 1ER 3BB 3K. (W, 1-0). 2014 Draft Prospect. Jordan Montgomery – LHP – South Carolina – So. 6IP 5H 0ER 2BB 5K. (W, 1-0). Tyler Webb – LHP – South Carolina – Sr. 1.2IP 0H 0ER 1BB 2K. (S, 1). Alec Rash – RHP – Missouri – Fr. 1IP 0H 0ER 0BB 1K. Unsigned 2nd Round Pick in 2012 (PHI). Adam Plutko – RHP – UCLA – Jr. 6.2IP 7H 2ER 1BB 6K. Trevor Williams – RHP – ASU – Jr. 5IP 4H 2ER 2BB 4K. Coming off 12-2 Sophomore season. Dan Child – RHP – Oregon State – Jr. 5IP 6H 2ER 2BB 4K. (W, 1-0). Jake Reed – RHP – Oregon – So. 6IP 4H 0ER 2BB 7K. (W, 1-0). 2014 MLB Draft Prospect. Konner Wade – RHP – Arizona – Jr. 6.1IP 1H 0ER 1BB 8K. 11-3 as Sophomore in National Championship Season. Carlos Rodon – LHP – NC State – So. 6IP 5H 5ER 1BB 8K. (L, 0-1). Potential 2014 1st overall pick. Kent Emanuel – LHP – North Carolina – Jr. 9IP 4H 0ER 0BB 5K. (W, 1-0). Buck Farmer – RHP – Georgia Tech – Sr. 8IP 4H 0ER 0BB 14K. (W, 1-0). Unsigned 15th round pick in ’12 (MIL). Daniel Gossett – RHP – Clemson – So. 6.2IP 4H 0ER 1BB 6K. 2014 Draft Prospect. Brandon Leibrandt – LHP – FSU – So. 5IP 5H 4ER 1BB 6K. (W, 1-0). 2014 Draft Prospect. Dillon Overton – LHP – Oklahoma – Jr. 7IP 2H 0ER 1BB 7K. (W, 1-0). Unsigned 26th round pick in 2010 (BOS). 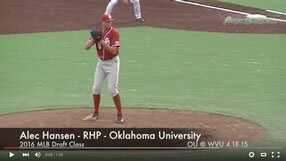 Jason Hursh – RHP – Oklahoma St. – So. 6IP 4H 2ER 3BB 5K. Redshirt So. missed 2012 with Tommy John surgery. Brandon Finnegan – LHP – TCU – So. 6IP 5H 0ER 2BB 4K. (L, 0-1). Parker French – RHP – Texas – So. 7IP 3H 0ER 0BB 5K. (W, 1-0). 2014 Draft Prospect. Corey Knebel – RHP – Texas – Jr. 0IP 2H 1ER 2BB 0K. Trae Davis – RHP – Baylor – Jr. 1.2IP 1H 0ER 1BB 1K. Frank Duncan – RHP – Kansas – Jr. 6IP 8H 3ER 2BB 5K. Chad Green – RHP – Louisville – Jr. 4IP 7H 2ER 0BB 2K. (L, 0-1). Dace Kime – RHP – Louisville – Jr. 3.1IP 2H 0ER 2BB 2K. Jeff Hoffman – RHP – East Carolina – So. 4.2IP 4H 4ER 4BB 7K. (L, 0-1). Austin Kubitza – RHP – Rice – Jr. 6IP 4H 0ER 4BB 12K. (W, 1-0). Huge game against good Stanford team. Ben Lively – RHP – Central Florida – Jr. 6IP 5H 0ER 0BB 5K. (W, 1-0). Went 9-2 3.00 as a So. in 2012. Tony Rizzotti – RHP – Tulane – So. 9IP 1H 0ER 1BB 5K. (W, 1-0). Michael Lorenzen – RHP – Cal State Fullerton – Jr. 1IP 0H 0ER 0BB 0K. (S, 1). Scott Squier – LHP – Hawaii – So. 4.2IP 4H 2ER 3BB 2K. (L, 0-1). 2014 Draft Prospect. Andrew Thurman – RHP – UC Irvine – Sr. 5.2IP 5H 1ER 0BB 4K. (W, 1-0). Andrew Vasquez – LHP – UC Santa Barbara – So. 3.2IP 4H 1ER 3BB 4K. (L, 0-1). 2014 Draft Prospect. Michael Cederoth – RHP – San Diego State – So. 5IP 4H 1ER 5BB 6K. (W, 1-0). Against cross town rival San Diego. Tyler Linehan – RHP – Fresno State – Jr. – 1IP 1H 0ER 1BB 1K. Dylan Covey – RHP – San Diego – Jr. 3IP 8H 5ER 2BB 1K. (L, 0-1). 2010 unsigned 1st round pick, won’t go as high in 2013. Tyler Olson – LHP – Gonzaga – Sr. 5IP 5H 0ER 4BB 7K. (W, 1-0). Scott Frazier – RHP – Pepperdine – Jr. 7IP 3H -ER 0BB 7K. (W, 1-0). Unsigned 5th round pick in 2010 (PHI). Colin Welmon – RHP – Loyola Marymount – So. 6IP 5H 2ER 2BB 5K. (L, 0-1). Kyle Finnegan – RHP – Texas State – Jr. 6IP 3H 2ER 4BB 11K. Cy Sneed – RHP – Dallas Baptist – So. 4.1IP 6H 4ER 3BB 2K. Tom Windle – LHP – Minnesota – Jr. 4IP 3H 0ER 2BB 3K. Brad Schreiber – RHP – Purdue – Jr. 4IP 2H 1ER 3BB 3K. Joshua Uhen – RHP – Wisconsin Milwaukee – So. 1IP 0H 0ER 1BB 2K. Taylor Williams – RHP – Kent State – Jr. 7IP 1H 1ER 2BB 5K. Brian Clark – LHP – Kent State – So. 1IP 0H 0ER 1BB 1K. Sean Manaea – LHP – Indiana State – Jr. 4IP 4H 1ER 3BB 6K. (L, 0-1). Potential Top 5 Pick. Albert Minnis – LHP – Wichita State – Jr. 1IP 3H 1ER 0BB 2K. Nick Petree – RHP – Missouri State – Jr. 5IP 2H 0ER 3BB 5K. John Straka – RHP – North Dakota State – Jr. 9IP 2H 0ER 0BB 6K. Anthony Bazzani – RHP – Eastern Kentucky – Sr. 5IP 7H 6ER 0BB 6K. (L, 0-1). Dan Tobik – RHP – Tennessee-Martin – Sr. 4IP 9H 3ER 1BB 5K. Lee Ridenhour – RHP – Austin Peay – Sr. 7IP 1H 1ER 0BB 7K. (W, 1-0). Aaron Goe – RHP – Morehead State – So. 7IP 7H 0ER 1BB 3K. (W, 1-0). Alex Gonzalez – RHP – Oral Roberts – Jr. 8IP 5H 0ER 2BB 4K. (L, 0-1). TJ Renda – RHP – Alabama State – So. 9IP 0H 0ER 1BB 15K. (W, 1-0). Justin Hageman – RHP – Western Kentucky – Jr. 1IP 4H 7ER 5BB 3K. Drafted in the 32nd Round in 2010 (KC). Cale Wine – RHP – Louisiana Monroe – Sr. 6.2IP 6H 0ER 0BB 5K. (W, 1-0). Hunter Adkins – RHP – Middle Tennessee St. – Sr. 8IP 4H 0ER 2BB 7K. (W, 1-0). Chance Cleveland – RHP – Arkansas Little Rock – Sr. 7.1IP 6H 2ER 0BB 8K. (L, 0-1). Hunter Brothers – RHP – Lipscomb – So. 4.2IP 2H 0ER 0BB 2K. (W, 1-0). Brother of Rockies RP Rex Brothers. Kurt Schulter – RHP – Stetson – Sr. 3.2IP 8H 3ER 3BB 4K. (L, 0-1). Drafted in the 38th Round in ’12 (BOS). Chris Anderson – RHP – Jacksonville – Jr. 7IP 1H 0ER 1BB 13K. Drafted in the 35th Round in ’10 (CHC). Tyler Moore – RHP – North Florida – Jr. 5IP 2H 0ER 0BB 6K. (W, 1-0). Travis Dean – RHP – Kennesaw St. – Jr. 4IP 4H 1ER 3BB 3K. (W, 1-0). A 14th round pick (NYY) in 2010 and in the 22nd round (TEX) in ’12. Ricky Knapp – RHP – Florida Gulf Coast – Jr. 6IP 2H 0ER 1BB 5K. (W, 1-0). 44th round draft pick (DET) in ’10. Ryan Gunther – RHP – Charleston Southern – Sr. 5IP 8H 4ER 2BB 5K. Tyler Herb – RHP – Coastal Carolina – Jr. 5IP 7H 3ER 3BB 1K. (W, 1-0). Anthony Montefusco – RHP – George Mason – Jr. 6IP 10H 6ER 1BB 4K. (L, 0-1). Kyle McGowin – RHP – Savannah State – Jr. 7IP 7H 0ER 1BB 7K. (W, 1-0). Tyler Barnette – RHP – Charlotte – Jr. 3.2IP 4H 2ER 6BB 4K. 9th round pick (BOS) in the 2010. James Norwood – RHP – Saint Louis – So. 3IP 2H 0ER 2BB 5K. (S, 1). Justin Brantley – RHP – Siena – Sr. 3.2IP 9H 6ER 2BB 2K. (L, 0-1). Chris Rowley – RHP – Army – Sr. 3.2IP 9H 4ER 2BB 3K. (L, 0-1).